Glamorgan Wanderers on the charge against Mountain Ash. Pic: James Assinder. Dai Sport’s Terry Phillips was a once-a-season visitor to Glamorgan Wanderers during the 1990s when he was reporting on Gloucester RFC home and away. The Cherry and Whites were regular visitors to South Wales back then. So, what caught his eye when he went along to Wanderers’ ground in Ely for the National League match against Mountain Ash? Phillip Pariyo, a pacey winger from Uganda, is leading Glamorgan Wanderers on a National League title charge. The Wanderers are top of the Division One East Central table and proved too strong for a spirited Mountain Ash team at the Memorial Ground, Ely. Pariyo seemed to glide over the muddy surface and scored a hat-trick of tries, while Rob Evans and Rob Brookson also went over. Luke Fish (2) and Callum Bricknell added conversions. Wanderers are a club with a rich history, having been formed as Old Monktonians by ex-pupils of Monkton House School in 1893. Glamorgan Wanderers hat-trick ace Phillip Pariyo. Pic: James Assinder. Their name was changed to Glamorgan Wanderers two decades later. Sir Tasker Watkins, who was awarded the Victoria Cross for bravery in the Second World War, is a former Welsh Rugby Union and Wanderers President, while ex-Wales captain Sam Warburton is among their former players. Wanderers produced a solid team performance against Ash and team manager John Lyons said: “The win should have been a little more comfortable from the possession and territory we had, but the Old firm were tenacious and spirited. On a bright, cold and sunny afternoon the pitch looked heavy after the snow, but the surface was clear and in decent condition. The speed and awareness of Pariyo, a 26-year-old player who has been in the UK for four years, is a major asset for Wanderers. The Ugandan international, a former player for Kyadondo RFC in Uganda, came to Wales after claiming asylum, along with team-mate Benon Kizza, following the 2014 Commonwealth Games in Glasgow. Pariyo played for St Peter’s when he first came to Cardiff, where the Ugandan duo were staying at a hotel for refugees in the city, and was granted political asylum two years ago. Now he is a key player for Wanderers, who are focused on promotion. After their win against Mountain Ash news quickly spread around the club that closest rivals Rhiwbina RFC had lost 14-13 against St Joseph’s. Action: Glamorgan Wanderers v Mountain Ash. Pic: James Assinder. “Good old St Joes,” said one Wanderers supporter as spectators headed into the bright, comfortable bars at the Memorial Ground. Ash made a fight of it, clawing back a 14-0 deficit to move within four points of their hosts, but Wanderers always seemed to have an edge with Pariyo a constant threat. Prop Dean O’Brien marked his 250th first XV appearance for Mount by driving over for a try which outside-half Morgan Cartwright converted to make it 31-17 in the 79th minute. It was a revenge win for the home team, who were edged out 27-26 at Mountain Ash earlier this season. The next test for Glamorgan Wanderers is at Porth Harlequins on Saturday, February 16. Wanderers starting XV: Rob Evans; Phillip Pariyo, Cameron Gibbon, Josh Male, Will Adams Jones; Luke Fish, Ioan Lewis; James Greenfield, Aaron Fowler, Joe Russell, Rob Weston, Tom Ellis, Dan Apsee, Lee Highgate, Rob Brookson. Reps: Rob Lewis, Dylan Lawley, Mike Owen. Mountain Ash: Morgan James; Rhys Davies, Kieran Davies, Alex Hughes, Steven Brittain; Liam Jones, Ross Davies; Geraint Lock, Jarrad Parfitt, James Cowdry, Adam Parry, Daniel Phillips, Kriss Sanders, Jordan Coxley, Chris Edmunds. Reps: Jordan Howe, Dean O’Brien, Cory Roberts. Cons: Luke Fish (2), Callum Bricknell. While Wanderers celebrated their victory in Ely, Rhiwbina were in shock after losing to a late penalty at St Joseph’s. Rhiwbina scored two outstanding tries, but, as the game went into added time the Joes were awarded a penalty right in front of the posts. Lee Marshall slotted it over and the referee blew for time. Rhiwbina, who have four games in hand on Wanderers, play their next fixture against Dinas Powys at home on Saturday, February 16. The Squirrels have a massive start to next month when they welcome the Wanderers and Rumney, now in fourth, on successive weekends. They also still have to face leaders Wanderers away, at the Memorial Ground on Saturday, Match 30. Rumney’s game at Treorchy was postponed and that allowed Dinas Powys, who beat Llantrisant 24-19, to move above them into third spot. 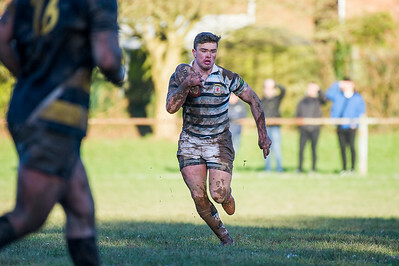 Jack Maynard scored twice in a bonus-point win for Dinas and Carwyn Jones and Finlay Davies were their other try scorers. Elsewhere, Bridgend Athletic won 26-15 at home against Porth Harlequins. Action: St Josephs v Rhiwbina. Rhiwbina have also qualified for the Glamorgan County Silver Ball quarter-finals. The Squirrels won all 10 of their qualifying fixtures and will play Ystalyfera, current leaders of Division One West Central, at a neutral venue on a date to be decided. The full draw is: Birchgrove v Penallta, Nantyffyllon v Fairwater, Senghenydd v Hirwaun, Ystalyfera v Rhiwbina. Results: Bridgend Athletic 26, Porth Harlequins 15; Dinas Powys 24, Llantrisant 19; St Joseph’s 14, Rhiwbina 13; The Wanderers 31, Mountain Ash 17. Saturday, February 9: Porth Harlequins v Treorchy; Dinas Powys v Bridgend Athletic. Saturday, February 16: Cambrian Welfare v Bridgend Athletic, Llantrisant v Gilfach Goch, Mountain Ash v Rumney, Porth Harlequins v The Wanderers, Rhiwbina v Dinas Powys, St Joseph’s v Treorchy.